It has been a while, but I continue my translation and brief analysis of Castelloza within my Trobairitz research. I didn’t mean to take so long, but this is a peripheral study disjointed from my primary research or other projects. At the moment I don’t know if I will be doing anything with this other than creating a series of blog posts as I translate each of the Trobairitz poems piecemeal. But, honestly, I am hooked and can’t stop. The Trobairitz are like the sirens of medieval studies, beckoning me to their chansons despite the ticking time-bomb of pending deadlines and papers looming, ever closer as Fall season approaches even though we have not yet even crossed the threshold of Spring. Alright, enough ranting…. here is my latest (ever small) contribution to the Trobairitz tradition of a translation of Castelloza’s “Mout avetz.” Yes, her work has previously been translated, but I have found I understand the works better when I provide my own translations and analyses. E motz triatz e chausitz. Mor dompna, s’om tot no.il lanssa. That you love me without hesitation. Could be had without your love. And tries and chooses his words. A lady will die if not helped. You will find a nice reception. First, the poem follows Castelloza’s general style of the five stanza format while also maintaining the stricter style and subject of Trobairtiz poetry. She laments the loss of her love, his betrayal, and her subsequent suffering, but she places no blame upon him and proceeds to forgive him for the pain he has inflicted upon her. Yet once again her forgiveness is laced with anger towards his abandonment as she indirectly chastises him for his neglect. Nevertheless she delivers her poem with a dose of sarcasm that does not escape detection, and also conveniently allows us a glimpse into her society. 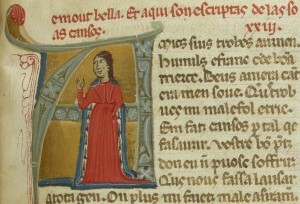 The time of greatest activity for the Trobairitz coincided with an overall renaissance in women’s rights since in the middle of the twelfth century in France, especially in the southern regions and Occitania, women regained much of the power they had not seen for nearly two hundred years. Thus when Castelloza steps into the dominant role, generally reserved for her male counterpart in poetry, she does so from the vantage point of a woman in possession of not just her quill and voice, but uses that voice to echo her position in society. She may be (as I discussed in a previous post) socioeconomically beneath her love interest, nevertheless regardless of her reasons for positioning herself beneath him, it is not because she is a woman. In other words, the implication here is that her stance which positions her beneath her lover is as much a self created pose as it is for the male Troubadour who castigates himself at the foot of his lady’s pedestal. She blatantly recognizes her reversal as she concedes that general practice is “Qu’om sol trametre messatge,” (When a man usually sends the message) of love to an ever patiently awaiting woman. Bouchard analyzed these lines as an apology where Castelloza negotiates her place within a poetic tradition through a pseudo apology – a practice the Troubadours never had to partake in since it was implied that men never had to apologize for their existence in any sphere and could move with a freedom unreserved for women. While I love Bouchard’s close reading of these lines, I do have to disagree and found another reason for Castelloza’s insertion of these seemingly apologetic lines. Almost smirkingly Castelloza acknowledges that her behavior sets a terrible example for all other female lovers while synchronously encouraging them to do the same. She is not apologizing as much as drawing attention to the solidarity between women who will now partake in this perhaps liberating behavior and act upon their desires as opposed to remaining within the confined roles of passive love interests. Her apology is really just a nod towards the agency she has a hand in eliciting. There are in fact several instances within the chanson that mark her extrapolation from self to a universal feminine exemplum – her personal grief and simultaneous joy derived from her lover become the suffering and joy of every woman. These instances are set off from the rest of the chanson by her deliberate usage of the third person pronoun as she moves from “I” to “she” and from “my” to “her” (lines 28-30 and 39-40). Even though there are innumerable more points to be discussed here, especially concerning the feudal language she employs that allows us an even more detailed glimpse into the relationship between her and her lover, I think that is best left to another time – perhaps one day this will be more than just a series of blogposts. In the meantime, I want to draw attention to one last bit of a testament to what I feel is Castelloza’s sense of humor. The last stanza has been translated differently by Dronke and Paden in regards to her family and their response, real or perceived, to her predicament. My own translation is also a bit different, but as Bec has stated, what can be surmised and agreed upon is her reference to having a husband. I do not believe her family/lineage or husband will be elevated due to her status as a Trobairitz as others have stipulated, so the pain her lover has inflicted upon her for which those around her are glad is not reflective of their joy at the literary and performative success that the suffering has brought about, but rather it is an ironically descriptive statement. Most notably her husband’s joy at her misfortune would fit perfectly well within the genre of a malmarie where Castelloza acknowledges her husband and lover within the same composition while the former would have every reason to rejoice at the grief the latter inflicts upon his adulterous wife. And Castelloza does not skirt the issue. This is the work of a woman in control of her situation who doesn’t paint fairy tales, but navigates the problematic reality of her dual existence by choosing to candidly admit her reality one line before negating its importance as she returns her attention to her lover and her unending love for him despite how he torments her. Much like in her poem, Amics, here too she ends with a promise, yet this time it is not a veiled threat of what should befall him if he abandons her, but a promise of the kind reception that awaits his return. Even though the actual score for this chanson has not survived, and actually only one Trobairitz musical accompaniment has been preserved, by Beatritz de Dia, I found a pleasing rendition of Castelloza’s Mout Avetz set to music. Enjoy! Bouchard,Constance Brittain. 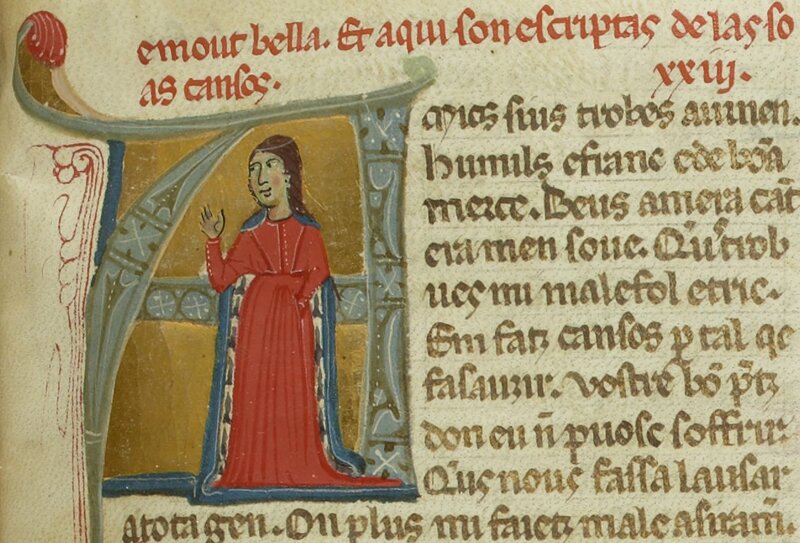 Strong of Body, Brave and Noble: Chivalry and Society in Medieval France. Paden, William. The Voice of the Trobairitz: Perspectives on the Women Troubadours.